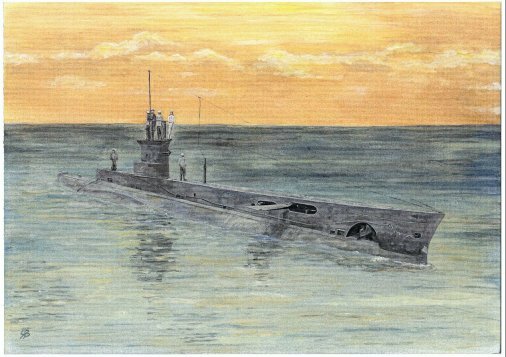 This painting is of the Group II submarine E-14 during April 1915 before she is fitted with a deck gun. There were 57 E Class submarines built. The E Class, or �overseas� as they were also known, were the first good and reliable submarine the Royal Navy had ever had. Being far superior to their ten D Class predecessors whose production ended in 1912, the bigger and better E Class was in much more demand and subsequently became the workhorse of WW1. The first two groups of E Class submarines (ten in Group I and twelve in Group II) were built in Vickers Yard, Barrow and also in HM Dockyard, Chatham. The third group however, saw for the first time ever, submarines being built in other yards around the country. Two boats (AE-1 and AE-2) were built for the Royal Australian Navy. While E-25 and E-26 were originally built for Turkey although the Royal Navy reclaimed them during construction. These dependable submarines fought throughout WW1. Initially they were based in Harwich and operating in the North Sea although before too long they were deployed to Mediterranean waters and involved in the campaign against Turkey as well as covering the Baltic and the Atlantic. All prints of this painting are individually hand signed by the artist. Group I had 4 18� torpedo tubes, 1 in bow, 1 in stern, and 2 in beam. Group II (12 boats) and Group III (35 boats) had 2 bow torpedoes. Around 1915 all boats were made or fitted with a deck gun (usually a 12-pounder/40, QF (76mm). Displacement: 662 tons surfaced, 807 tons submerged.